England have been drawn in Group G for the 2018 World Cup in Russia alongside Roberto Martinez’s Belgium. They will also face Tunisia and Panama, who are making their first ever appearance at a World Cup. England’s opening game will be against Tunisia in Volgograd on June 18. Gareth Southgate’s side will then play Panama on June 24 in Nizhny Novgorod, before finishing the group in Kaliningrad against top seeds Belgium. Should they make it through the group, England’s possible second round opponents are Japan, Colombia, Senegal and Poland. Elsewhere, European Champions Portugal will face 2010 winners Spain. Hosts Russia have been drawn with Uruguay, Egypt and Saudi Arabia. The holders Germany will play Mexico, Sweden and South Korea. In the second half of this World Cup preview, groups E-H will be analysed, as well as a few tips for the tournament overall. In this half of the draw Argentina and Germany will have the highest hopes, with France, Portugal and Belgium all looking to reach the latter stages. France have arguably got themselves an easy draw again. Ecuador and Honduras proved stern competition for England in the warm up matches, however this will not be in a friendly and France have a bit more quality up front than England. 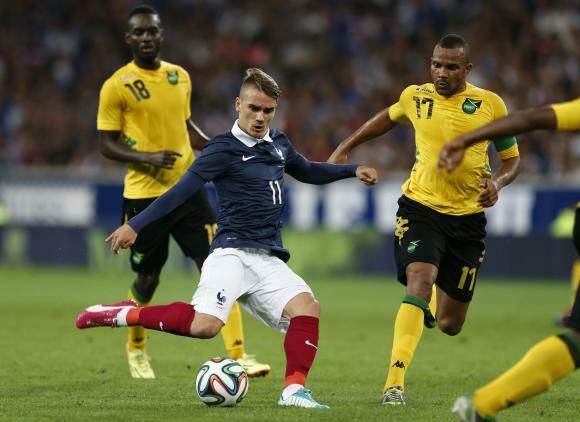 Karim Benzema will be leading the line for France, and the promising Antoine Griezmann (above) will be an exciting player to watch. Without Samir Nasri and the injured Franck Ribery the French dressing room will be more together than in South Africa. Ecuador proved against England that they will be no pushovers, playing an exciting brand of football via the wings. The are well suited to South American conditions, which may put them ahead of the Alpine-based Switzerland. The Swiss have some talented players in the form of Tranquillo Barnetta, Xherdan Shaqiri, Gökhan Inler and Haris Seferovic, but they are unlikely to be utilised to their full attacking potential. As always the Swiss will be solid at the back, with Juventus full back Lichtsteiner the pick of the defenders. Honduras will be there to make up the numbers, defending for their lives to claim 0-0 draws and chopping down their opponents. Argentina also have a fairly straightforward path through the group stages, with their group containing Nigeria, Iran and World Cup débutantes Bosnia-Herzergovia. Argentina’s attack is so strong that they could afford to leave Carlos Tevez at home, whilst still boasting Sergio Aguero, Angel Di Maria and of course Lionel Messi. They have a relatively strong defence as well, with Mascherano acting as either a defensive midfielder or a centre back and Zabaleta and Demichelis being part of a strong title winning Manchester City defence. Bosnia could prove a stern test for their opponents at this tournament. Only Germany, Netherlands and England scored more goals in qualifying than Bosnia, whose main goal threat will be Manchester City’s Edin Dzeko. They also have the impressive Roma midfielder Pjanic and Stoke’s dependable ‘keeper Asmir Begovic. Nigeria have the potential to progress, after winning the African Nations Cup. The squad is top heavy with strikers so you can expect goals at both ends when they play. Iran will be the whipping boys of this group, and will go home without scoring a goal. Another contender for the ‘Group of Death’, Group G contains Germany, Ghana, Portugal and the USA. Germany would be the favourites for this group, and one of the favourites for the tournament, however they have suffered several injuries in the lead up to Brazil. 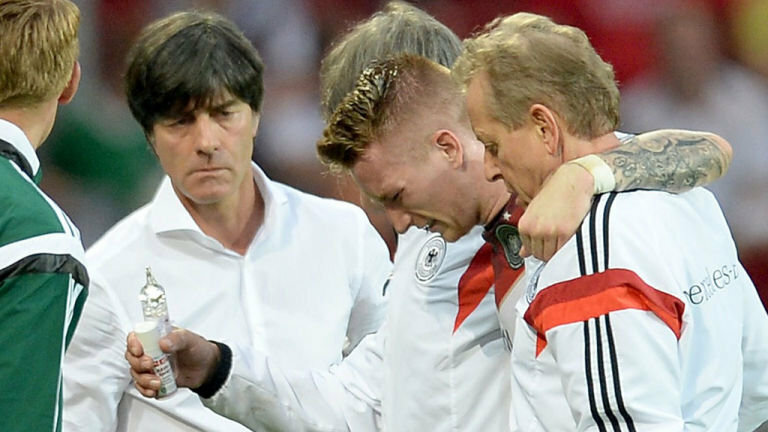 Marco Reus (above), Lars and Sven Bender, Mario Gomez and Ilkay Gundogan will all miss the World Cup, whilst Neuer, Lahm, Schweinsteiger, Khedira and Klose may not be fully fit for their opener against Portugal. However the quality is still there in the squad to compete, despite the inclusion of just one out and out striker, Miroslav Klose. Portuagal needed Cristiano Ronaldo to single handedly pull them through in their play-off with Sweden. Their squad is reasonably strong, containing 3 Champions League winners, as well as Manchester United’s Nani, Monaco’S João Moutinho and Sporting’s highly rated William Carvalho. Portugal have to potential to go far in this tournament, but if they rely on Ronaldo to bring them through they may be going home rather early. Ghana should have been semi-finalists four years ago. A few of their players this time around are past their peak, such as Michael Essien and Asamoah Gyan. The Ayew brothers could prove some entertaining viewing, as they prove Ghana’s main goal threat. In truth though, Ghana aren’t the same team as they were in South Africa and will probably fall at the first hurdle. The USA have brought a young squad to Brazil, leaving out the experience of Landon Donovan. They will be there for the experience, but don’t be too surprised if they take a point off of the big boys. Theoretically, Group H is also quite open. 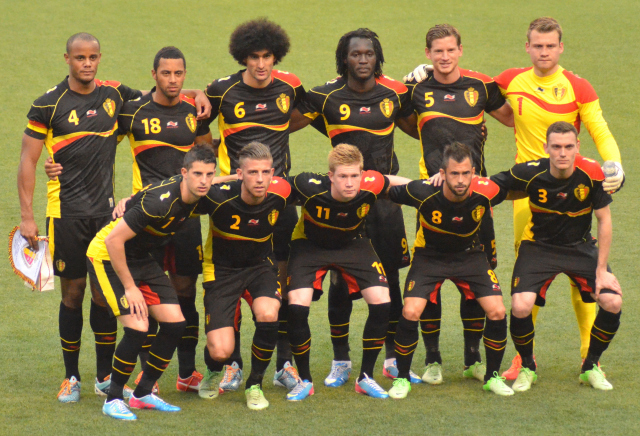 Belgium are hotly tipped to be amongst the contenders to win the World Cup, however this would be a step too far for this squad. Sure, they have an immensely talented squad, but do they have the experience to make the impact that everybody is expecting. Russia will also be expecting to qualify from the group, and they boast a strong spine, with Igor Akinfeev in goal, Denisov and Dzagoev in midfield and Kerzhakov up front. These players will have to perform, as the rest of squad may not be of the quality to push to the latter stages. South Korea could see qualification as a possible target. Son Heung-min had a good season in the Bundasliga, whilst Ji Dong-won, Park Chu-young, and Ki Sung-yueng all have Premier League experience. However, they may be seen as too lightweight and could ship a few goals per game. Algeria proved stubborn opponents four years ago, however they offered very little up front. Expect the same this year, with British fans noticing Spurs’ Bentaleb and ex-Rangers defender Bougherra. Brazil to beat Netherlands, Italy to beat Columbia, Spain to beat Croatia, England to beat Ivory Coast, France to beat Bosnia-Herzergovia, Germany to beat Russia, Argentina to beat Ecuador, Portugal to beat Belgium. 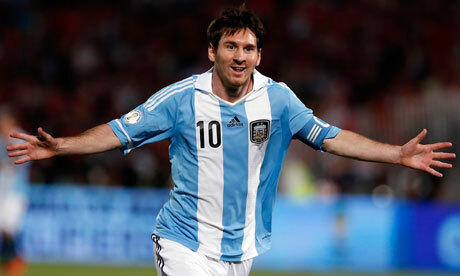 Brazil to beat Italy, Spain to beat England, France to beat Germany, Argentina to beat Portugal. Top Scorer: Neymar. A possible outsider for this could be either Antoine Greizmann or Karim Benzema. In the first half of this World Cup preview, Groups A to D will be analysed to find out who will be the first eight teams in to the Round of 16. Brazil and Spain will have the highest hopes, but Croatia, Chile, Columbia, Uruguay and even England could be looking to be the tournament’s dark horses. A preview for Groups E-H will follow soon. Hosts Brazil kick off the tournament tomorrow against Croatia and are widely expected to claim a full nine points. Much of the pressure will be on Neymar, as he is expected to carry his nation to the trophy. Mexico, Croatia and Cameroon will all be fighting for the second spot, and with the Africans only arriving in Brazil a couple of days ago due to pay disputes, it seems that they won’t be gone for long. Croatia have the makings of a really strong side, with Modric, Mandzukic, Rakitic, Kovacic and Lovren all performing well in Europe’s top divisions. Mexico narrowly qualified for the finals, and are without the likes of Carlos Vela in their squad. Much of the Mexican goalscoring hopes will rest on Javier Hernandez, who has had a dismal year at Manchester United. Group B is certainly a contender for the ‘Group of Death’ title, boasting Spain, Netherlands, Chile and Australia. Many are writing Spain off, and with a front line containing Fernando Torres, David Villa and a not fully fit Diego Costa goals might be hard to come by. Spain’s possession football should see them conserve energy in the tropical heat, which may be an advantage. The Netherlands squad contains a lot of players from the Eredivisie, especially defenders. This could be an advantage with the players knowing each other, but the strength of the Dutch division can be questioned. There will also be fitness concerns over talisman and captain Robin Van Persie and Wesley Sneijder. Chile showed their credentials last year as they stunned England 2-0 at Wembley. They have the potential to be dark horses in this World Cup, however Arturo Vidal may not be fully fit, resting much of the pressure on Alexis Sanchez. Australia have picked a relatively young side, with Mark Bresciano and Tim Cahill the obvious exceptions. In this way, this tournament will just be a learning experience for the Aussies, so expect them to take a few hidings. Group C is possibly the most open group, as any of the teams could realistically hope to qualify. Columbia are the favourites, even without the injured Falcao. They will instead call on Jackson Martinez and James Rodriguez to carry the team, with a potential star Juan Fernando Quintero (above) of Porto tipped to be one of the tournament’s golden boys. It could be argued that the Ivory Coast’s golden generation is no past it’s peak, but they too could still qualify from this group. An ageing Drogba could be replaced by Wilfred Bony or Seydou Doumbia up front, whilst Yaya Toure is coming to Brazil on the back of his best season ever. Japan have the potential to spring a surprise or two. Playmakers Shinji Kagawa and Kensuke Honda will be looking to put their indifferent seasons behind them, whilst Shinji Okazaki scored 15 goals for Mainz last season in the Bundasliga. Greece are the outsiders of the group. They scored just 12 goals in 10 games a qualifying group that contained Latvia, Lithuania and Liechtenstein. Samaras and Mitroglou will have the unenviable job of trying to get Greece scoring, but they will probably rely on getting three 0-0 draws. Much of England’s hopes in Group D will rely on the mental strength of Roy Hodgson, and whether he is prepared to drop the likes of Wayne Rooney and Danny Welbeck should they not be on form – which they aren’t. Despite the low expectations, England’s squad has more than enough talent to beat anyone on their day, but with the nation behind them the question is: will they crumble? The likes of Sterling, Lallana and Barkley (above) could all be bright sparks in Brazil, but will Roy utilise them? Italy could go far at this tournament, with a very talented squad. The possible frontline of Balotelli and Immobile is a mouthwatering prospect, and with Pirlo and Verratti pulling the strings, Italy pose a serious threat. However they are slow starters, so England have the best chance of beating them by playing them first. The defence is also beginning to slow up, so the pace of Sturridge and Sterling could prove a vital weapon. Uruguay are much fancied to go far in this tournament, but they really have not shown any reason for this. With Luis Suarez an injury doubt, the only real threat they pose is through Edison Cavani, with an ancient Diego Forlan and Palermo’s Abel Hernandez joining him up front. In defence Uruguay look ropey at best, with West Brom bench-warmer Diego Lugano and Liverpool’s injury prone defender Sebastian Coates at the back. They struggled through to a play-off with Jordan to qualify, and again will struggle in this group. Costa Rica proved strong at home during CONCACAF qualifying, but struggled when playing away. Brian Oviedo will be missing due to injury, whilst English fans will recognise Arsenal’s Joel Campbell and Fulham’s Bryan Ruiz. This afternoon the FA announced the England squad numbers for the upcoming World Cup. This may reveal how Roy Hodgson is looking to line up, perhaps giving the first 11 shirts to his preferred starting line up. If this is the case, the major talking point will be Frank Lampard’s selection, wearing number 8. The numbers suggest that Hodgson may resort to the same old England managers’ mistake of playing both Lampard and Gerrard together in midfield. This would see the omission of the in-form Jordan Henderson, who will wear 14, Adam Lallana (20) and Ross Barkley (21). The back five picks itself, with Hart, Johnson, Cahill, Jagielka and Baines being give the numbers corresponding to their respective positions, whilst captain Steven Gerrard will wear number 4 – which he usually wears for England and is synonymous with the Anchor Man role that he will be asked to play in Brazil. Jack Wilshere will wear the number 7 shirt despite his lack of appearances recently for Arsenal. It would appear Danny Welbeck will be played out on the left, with Daniel Sturridge, the top English goalscorer in the Premier League, being shoved out wide on the right. This, as shown in the most recent friendly against Denmark, will be a complete waste of Daniel Sturridge, just too accommodate the best 11 players that England have. Rather than playing Sturridge out wide, surely Hodgson would have learnt from that friendly and will look to play him centrally. Should the first eleven players be picked to start, this would mean the omission of Adam Lallana and Raheem Sterling, who have both had excellent seasons at Southampton and Liverpool respectively. However there is another way at looking at these numbers. As Frank Lampard is the vice captain, he may have been given his preferred number 8, which he has worn for club and country for over a decade. Chris Smalling (12), Jordan Henderson, Alex Oxlade-Chamberlain (15), Adam Lallana (20) and Luke Shaw (23) have all been given numbers outside of the 11, but they also wear these numbers for their clubs, so these could be their preferred numbers. Hodgson has recently said that he hasn’t yet decided who will start against Italy in England’s opening game, so don’t be surprised if anyone in the squad makes it in to the team in Manaus. England have been given a tough group in the World Cup. The seeded team in the group are Uruguay, with Italy also joining England as the extra European side. Costa Rica make up the group. Uruguay are ranked 6th in the FIFA World rankings, with Italy ranked 7th. England are the third highest ranked team in the group, ranked 13th, whilst Costa Rica bring up the rear in 31st. Although on paper this looks a tough group for England, which it is, it is very possible that they could qualify for the next round. Even if you write off the Italy match, qualification is still very plausible. Uruguay are the highest ranked team in the group, and have a formidable front line of Cavani and Suarez, but their defence is suspect. They had to qualify through the play-offs, and should England neutralise Luis Suarez, you would imagine that Uruguay would not offer anything going forward. This will allow the likes of Rooney, Townsend, Walcott or whomever is playing to attack the leaky defence. The task of neutralising Suarez and Cavani is a big one, and there will undoubtedly be calls for John Terry to return to the England squad. This would be a step back however, as Gary Cahill and Phil Jagielka have been solid throughout the qualification period, and are both regulars for top Premier League teams. Selecting Terry, who has been part of an England team that has failed regularly throughout the so-called ‘golden generation’, will just be a crushing blow to the current shirt holders, as it will tell them that they aren’t good enough. This means that should one of them be needed to fill in at centre back, which is likely because John Terry’s fitness is questionable given his advancing years, they will be demoralised and scared of making a mistake, which is how England have played in the past few World Cups. Costa Rica aren’t to be underestimated, however England should really be beating them.